Fellowship Previews: The Plot To Destroy ALL Transformers Has Begun! The Plot To Destroy ALL Transformers Has Begun! This August, General Joe Colton, the original G.I. JOE, will take the fight directly to the TRANSFORMERS home world of Cybertron in the Hasbro Comic Book Event of 2017 – First Strike! This six-part, bi-weekly series will feature the talents of writers Mairghread Scott (TRANSFORMERS) and David A. Rodriguez (SKYLANDERS), with art by Max Dunbar (DUNGEONS & DRAGONS), and colors by Ander Zarate (MICRONAUTS). Earth’s heroes have united after the explosive events of last year’s REVOLUTION! Bringing together G.I. JOE, ROM, the MICRONAUTS, M.A.S.K. : MOBILE ARMORED STRIKE KOMMAND, ACTION MAN, and the TRANSFORMERS, Earth has never been more secure now that it has become a member of the Council of Worlds due to Optimus Prime’s leadership. The premiere season of post-REVOLUTION titles are heading towards their natural conclusions to make room for First Strike so fans can enjoy the action in one place (and go easy on their wallets during the event)! 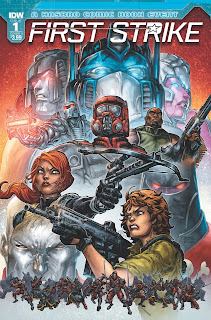 In addition to the main series, six additional one-shots will set the stage for the second season of the Hasbro comic universe, where fans will witness their favorite characters forming new alliances, paving the way for exciting adventures to come. Look for Micronauts: First Strike, by Christos Gage and Chris Panda, G.I. Joe: First Strike, by Aubrey Sitterson and Ilias Kyriazis, and Optimus Prime: First Strike by John Barber and Guido Guidi in September. M.A.S.K. : MOBILE ARMORED STRIKE KOMMAND. : First Strike, by Aubrey Sitterson and Ilias Kyriazis, Rom: First Strike, by by Christos Gage and Chris Panda, and TRANSFORMERS: First Strike by John Barber and Guido Guidi will follow in October. These one-shots will explore more corners of the event for completest readers who just can’t get enough, while also providing a glimpse into what the future will bring for our heroes when the dust settles on the scorched planet of Cybertron at the conclusion of First Strike. In the back of the #0 issue, you’ll find a handy checklist for the entire event running through October, as well as a couple new #1s scheduled for November and December titled G.I. JOE: UNMASKED and ROM & THE MICRONAUTS, respectively. Keep checking the IDW site, as well as following IDW on social media, as more info about these exciting new titles becomes available!